Please share this email with activists or community members interested in local work going on across Canada regarding sponsoring LGBT Refugees. Note that an RSVP is requested. 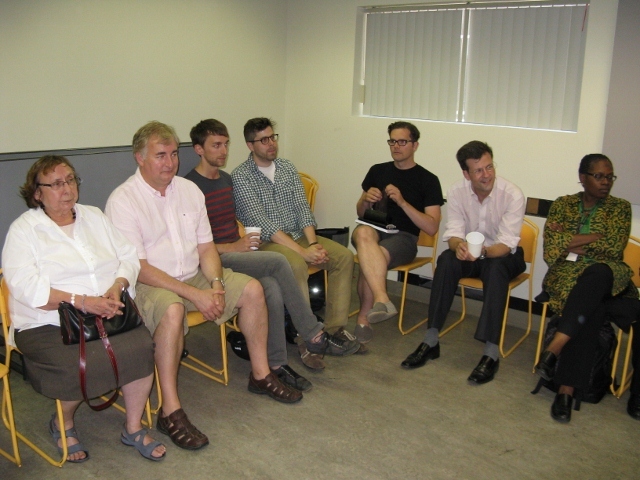 We are promoting a free opportunity for people to join us in person or via a conference/video call during World Pride in Toronto to network on LGBT refugee issues. 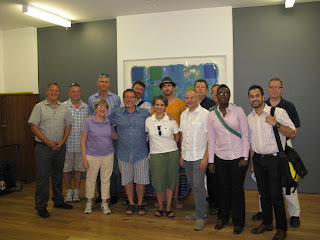 Please read on…..
WHAT: A chance for people working specifically on LGBT refugee sponsorship issues to connect/chat/network/share in a positive environment. The meeting and social will be designed to learn more about each other’s work and our respective challenges and successes. WHERE: Toronto and for those not in Toronto those days, a connection via a conference/video call link up for those unable to be in attendance. The in-person portion of the program will be in a location to be determined. 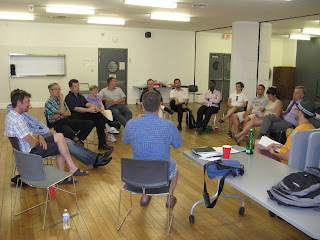 WHY: A number of people who are working on sponsorship issues thought that with several people being present in Toronto for World Pride 2014 that it would be a good opportunity to connect and meet and share areas of interest, achievement and plans. WHO: Anyone who is working on LGBT Refugee issues from a sponsorship perspective, including those looking to get more involved is welcome to join us. INTERESTED? : If you are interested and want to send an “expression of interest” to be put on the mailing list for this event, please send an email by June 2, 2014 to: northstartriangle@gmail.com. Please note that your name will not be shared with any other groups without your express consent. The small print: This is a self-funded adventure. We are keeping it casual, low stress (! ), and as spontaneous as possible (while having it well organized). There will be no fees or charges to attend. If food is involved, it will either be donated or people will be asked to pay their own way. The individuals who are taking the initiative do not have any funding and expect the two events to be low cost and accessible to all. We are looking to have someone sponsor the conference/video call. 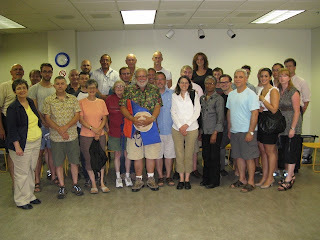 We had 15 people join us at 8am for Neil's talk. 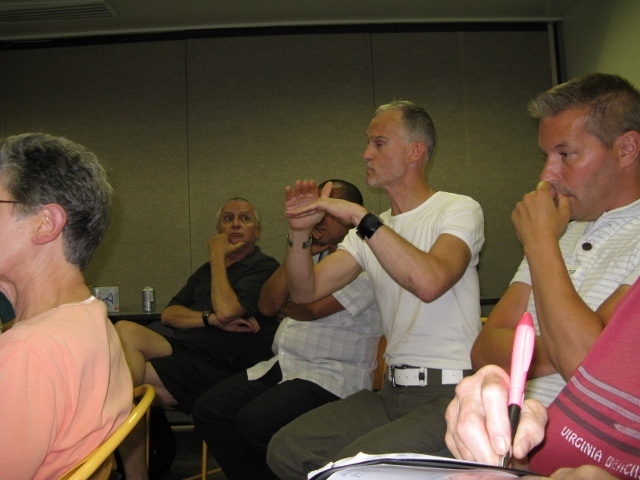 He provided an overview of pressing issues facing LGBTI people who face danger in many countries in the world. There were questions and lots of interest from everyone who attended. 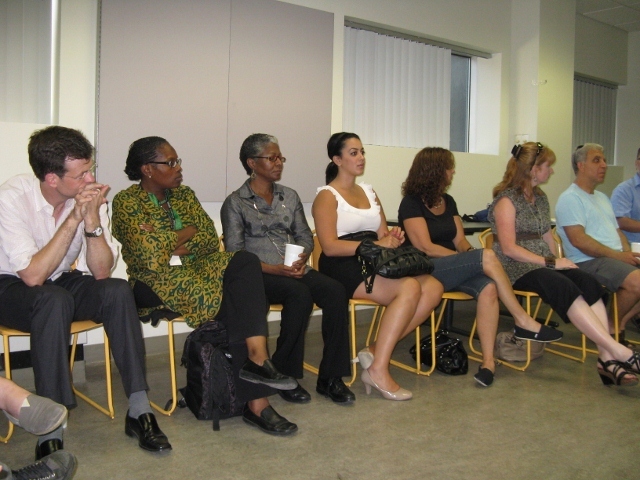 We were particularly pleased to have three people from the new Immigration and Refugee Board http://www.irb-cisr.gc.ca/Eng/Pages/index.aspx also present and participating. We must have dialogue with people in all parts of the refugee system to ensure that Canada leads on these issues and does not withdraw from our international humanitarian and moral obligations. Delighted to have a number of local Ottawa community join us. 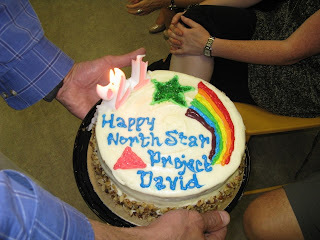 North Star Triangle Project is now ready to launch our 2012 activities. We are very excited to be a joint sponsor of the upcoming visit of Neil Grungras the founding executive director of the San Francisco-based Organization for Refuge, Asylum and Migration (ORAM). 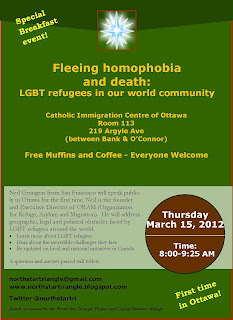 Please join us for a free breakfast event on Thursday, March 15, 2012 to hear Neil speak on the topic: Fleeing Homophobia and Death - LGBT Refugees in our world community. Happy Anniversary UN Convention on Refugees! The 2011 National tour is now complete -- with 21 cities in ten provinces visited and over 200 people participating in the meetings of the North Star Triangle Project. I am honoured by the participation, interest and enthusiasm of so many people. In the coming days and months I will be reflecting on what these 3 1/2 months have meant. I will keep everyone who indicated an interest posted through email and this blog. Read about the meetings in the last 3 cities below this post as I have just completed meetings in London, Toronto and Ottawa. It was 60 years ago today that delegates from 26 countries, including the United Kingdom, gathered in Geneva to sign 1951 Convention relating to the Status of Refugees. It was created to protect European refugees after the horrors of the Second World War. 60 years later, the Convention still serves as a beacon of protection. It has saved the lives of millions of people around the world; and while war, persecution and human rights abuses still exist, the Convention will continue to save millions more. The 1951 UN Refugee Convention is the cornerstone of 60 years of the Refugee Council’s untiring work to support and protect people who flee to the UK[ or Canada!] in search of safety. Today, we continue to speak out for the right to asylum and to ensure that a safe haven will always be there for those who need it. (Thanks to the UK Refugee Council for this). Ottawa -- a "home" run! How do you express gratitude to family, friends, activists and everyone who has come out to a North Star Triangle Meeting? Coming home to Ottawa I felt exhilarated and exhausted. A 3 1/2 month tour across Canada primarily by bus, some train and few planes has not left me physically exhausted but so energized. I must confess that my mental exhaustion was starting to take hold after 21 cities and 10 provinces in such a short time. I had the occasional slip of the tongue as to what city or province I was in -- and in the last leg of the trip, I woke up on 2 different mornings having to think for a long minute: "where am I?". 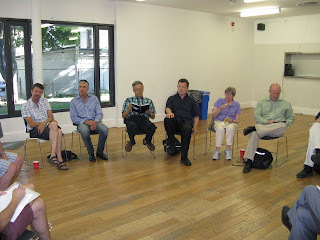 I could not believe that 42 people (by my count) made their way to the Catholic Immigration Centre in downtown Ottawa last night for my last presentation. It was incredible. It was warm (literally and metaphorically); and it was energized. 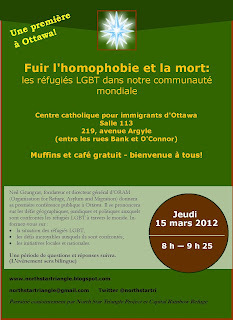 I am so excited about the future of community mobilization around queer refugee issues in my city. We will be able to join the work already underway for LGBTQ refugees and give further help I believe. There is a fair bit more to say -- and I am going to be spending the coming weeks pondering those thoughts and coming back to everyone with them. In terms of Ottawa -- I must say thanks to a few people. My partner Michael has been incredible throughout. Being away on the road at an important time of his life was a sacrifice for him and I am so thankful that he always insisted on the work carrying on. 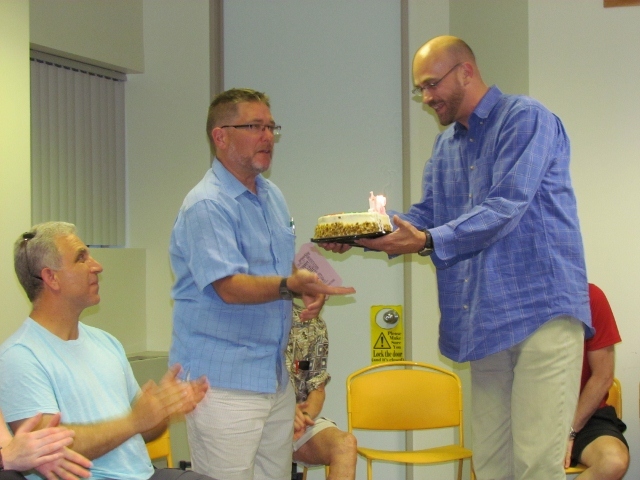 My other "partner" Michael (in community action) surprised me in the most touching way last night by bringing out of his purse a beautiful cake that he had decorated himself and a "21" candle on it. Check it out below. 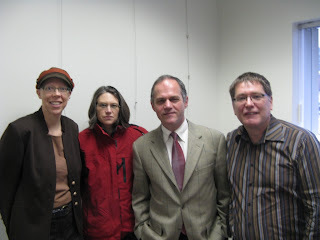 Michael Stephens is an incredible human being who has given me so much insight into how to make activism fun. He was also an amazing sounding board back in the winter when we met at the famous Green Spot Restaurant in Montreal to talk it through. Thanks to my Michaels…. Every stop required a volunteer photographer and an old friend, colleague and supporter Larry Hill was there for me (again) last night. He along with 5 of my colleagues from the Ottawa Police made my homecoming that much more special. Thanks to the Ottawa 42! We have a great journey to continue...I hope you will stay on it! if there wasn't a cake! 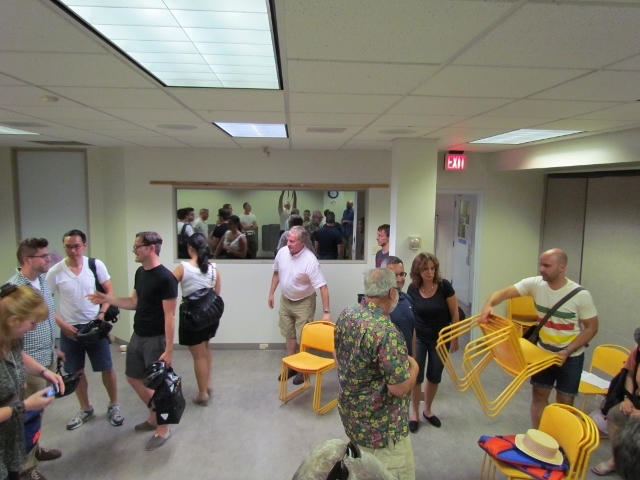 The clean up crew -- thanks everyone for pitching in! Toronto -- home of 3 amazing LGBTQ groups for queer refugees! 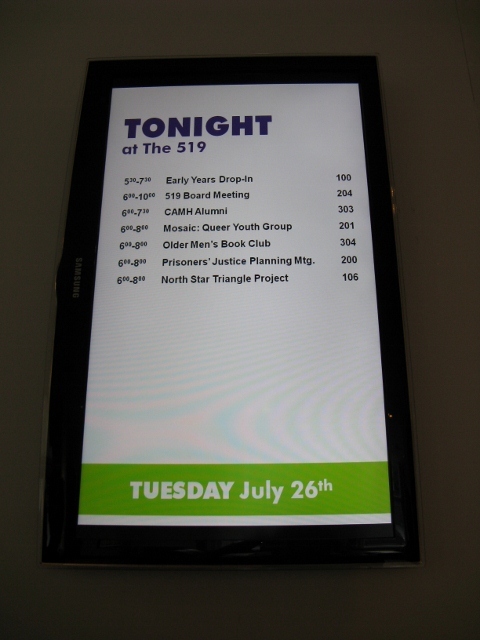 Heading to Toronto was going to be a homecoming of sorts for the North Star Triangle Tour. There are a few people in Toronto who have given me so much support and encouragement throughout that I knew it would be an incredible second last city on the national tour. And of course my dear and amazing friend Joan Anderson from Rainbow Railroad did not let me down. www.rainbowrailroad.ca/ Joan was one of the very first people I consulted in January of this year about the North Star Triangle Project. 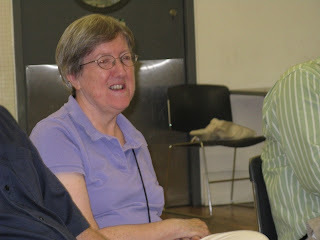 We met at a Tim Horton's (in true Canadian spirit) and she gave me invaluable insight into the work. She followed my progress over these past six months and was always keen to pitch in and help on anything. 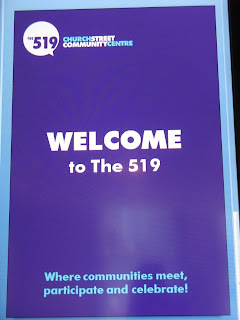 She was joined by David Snoddy, a long time colleague in the struggle for equity and equality, in bringing the meeting together at the newly renovated (to me) 519 Church Street Community Centre. It was a beautiful location where we were joined by 18 folks as well as two other incredible organizations which I have spoken about throughout the tour. First there was Gilles Marchildon from the IRQR -- Iranian Refugee Queer Railroad -- http://www.irqr.net/ . Gilles spoke about their work and I was thrilled he could bring a message from Arsham at IRQR who was away on emergency business. 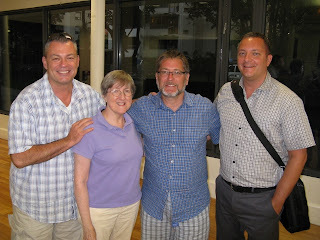 Finally we were joined by Brian Brenie from the MCC -- the Metropolitan Community Church where the Rev. Brent Hawkes is the senior pastor. 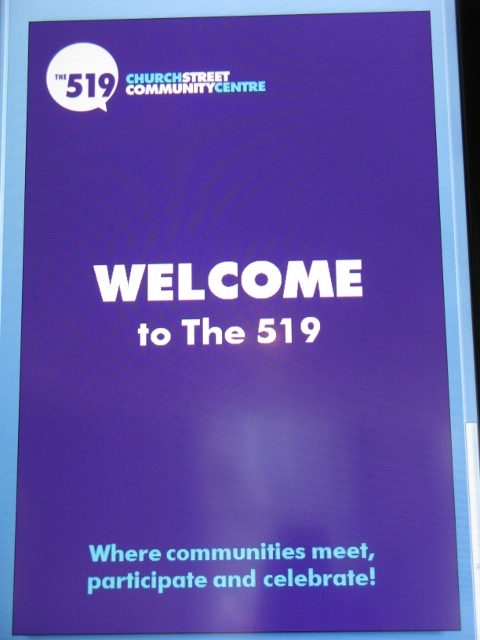 Check out their amazing refugee work at: http://www.mcctoronto.com/. And now Brian is the full time coordinator of refugee programs. Watch for amazing things to happen at the MCC! 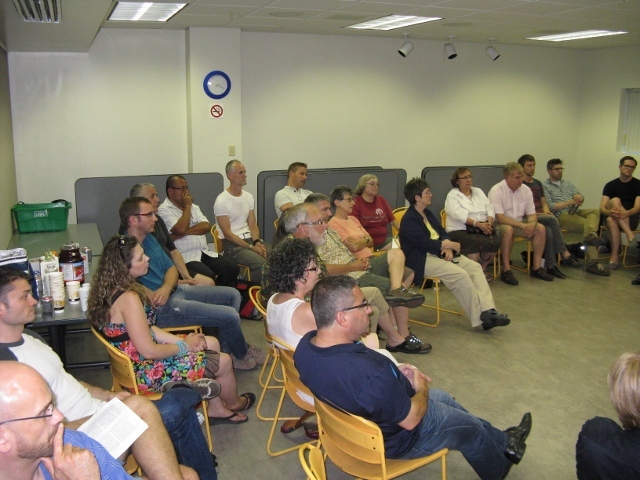 There were so many others who spoke and shared their personal experiences as refugees currently in the process with the Immigration Refugee Board or working in the area of research. 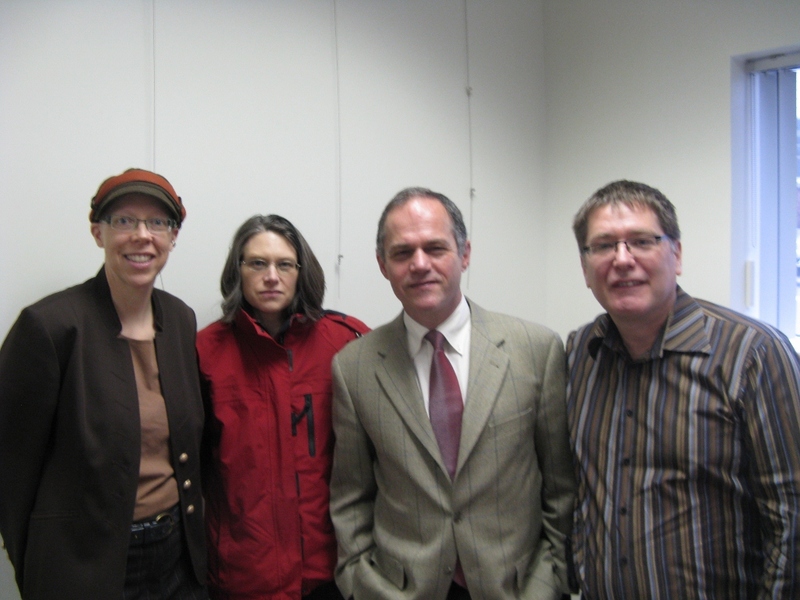 This included Robert Lidstone who is doing his doctorate at the Centre for Refugee Studies at York University. 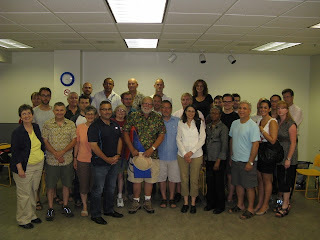 I appreciated their insight and participation which made the meeting even more meaningful. It was a very productive meeting and good to be in the heart of queer Toronto. PS: There is always a PS! Two of my dearest supports in Toronto also joined me on Tuesday night. Their ongoing enthusiasm, confidence, feedback and all around "being there for me" attitude has been touching beyond belief. Thanks for my bed in Toronto Glen -- and thanks for the true cheerleader (without the outfit) attitude Kerry! London, Ontario -- in the home stretch! 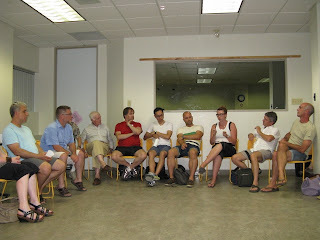 Reaching city #19 -- London, Ontario -- was a reminder that I was in the home stretch of the 2011 National Tour. One of the principles of the North Star Triangle Project is to tap into my old "cob-webby" networks and rely on the kindness of strangers. London was a perfect example of this as I relied heavily on a very old and dear friend and former colleague Peggy Sattler. 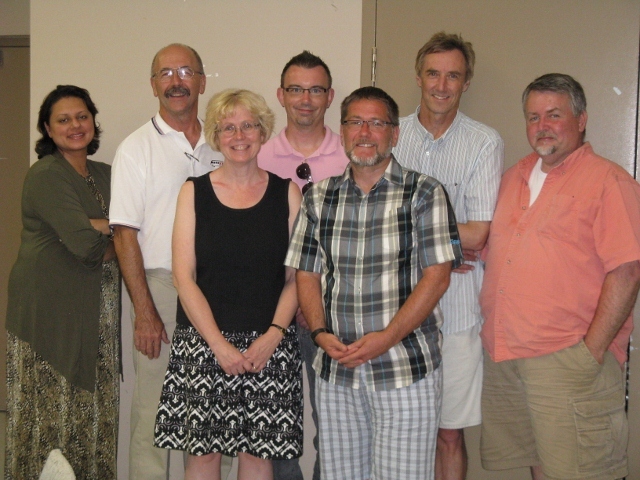 Peggy is currently a Trustee with the Thames Valley School District Board. She is also a remarkable woman who has worked for social justice. We don't see each other nearly often enough -- but when we do -- it is like no time has passed. Peggy made London happen. She got me the room, she publicized the meeting and with the help of others made for a nice meeting on Monday, July 25th. Now for the kindness of strangers. Steve Holmes is a retiring London bus driver. A union activist. 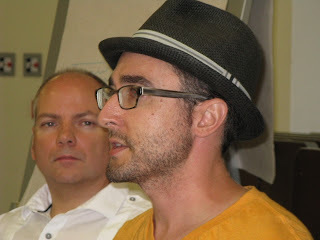 A candidate for the NDP in London Centre in the upcoming provincial election. He was also the (former) stranger who was there at my meeting to open the doors, help me set up and participated fully. 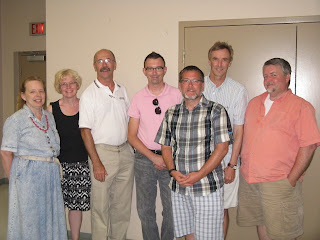 London also has an incredibly LGBTQ positive school board, currently under the leadership of Board Chair Tracy Grant who was a wonderful participant and a joy to connect with after the meeting over a drink. I can't imagine how the tour could have happened without the support and assistance of so many friends, colleagues, strangers, and people who just want to make a safer world for people. Thanks London! And congratulations on a fabulous event and an amazing Pride Weekend with the full participation of your mayor and chief of police! PS to Hurly at www.thumbsupcanada.blogspot.com : My couch surf in London was incredibly comfortable! The "other" London Group of 7 -- guess who took each photo! I am David Pepper and in 2011 I travelled across Canada to all 10 provinces by bus and train (rarely by plane) to create awareness about LGBT refugees and the potential to sponsor them here in Canada. Watch my blog -- the NSTP continues now that the National tour is complete with further public education and local initiatives. 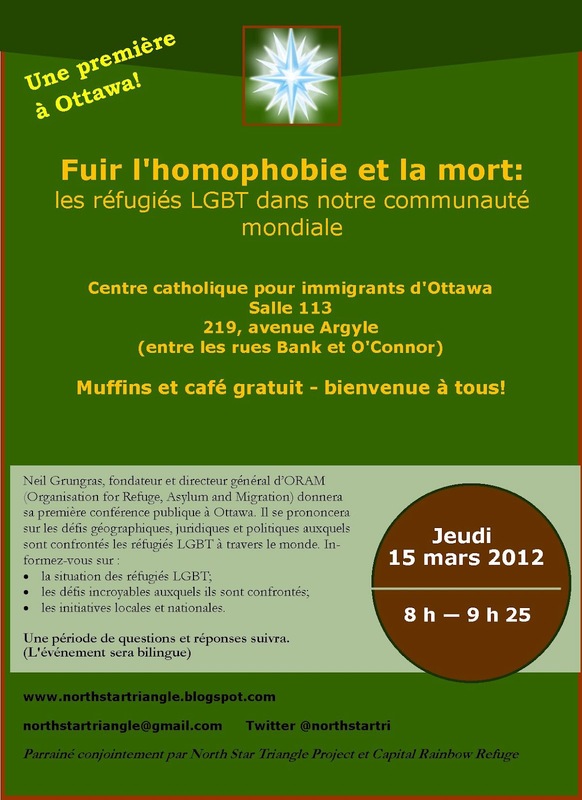 If you are concerned for LGBT and queer refugees in the world -- contact me. I travelled across Canada in 2011 to share information about the amazing work being done by LGBT activists and help mobilize communities to help. 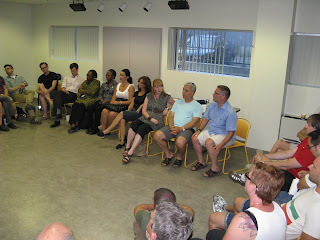 The work continues in 2012 with networking and public education initiatives.